The Ola hotel El Vistamar is particularly suited to those holidaymakes who wish to enjoy the peace and relaxation of a stay on Mallorca. 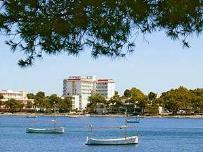 The hotel is situated in the lovely fishing village of Porto Colom which is set on a picturesque coastline dotted with pine trees. There are many small, colourfully-housed shops offering souvenirs located the vicinity and a good choice of small bars and restaurants. A small inlet suitable for bathing is just close by. From the hotel, guests can enjoy a wonderful view over the bay and the sea. For those who want to take a trip to a bigger, livlier resort, Cala d'Or is only 6km away, or a trip to the golf course of Vall d'Or is just 5km away. This Hotel offers the 'best of both worlds', the lovely, peaceful Mallorca for total relaxation yet close to busier larger resorts.